Norton is a town in the province of Mashonaland West, Zimbabwe. 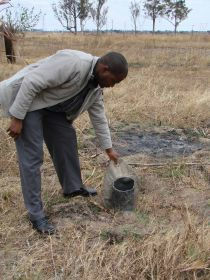 It is located about 40 km west of Harare on the main road and railway line connecting Harare and Bulawayo. It is a town in decline. The pressures of 12 years of national mismanagement and the impact of HIV / AIDS has ripped the heart out of this community. There are now large numbers of widows that are HIV+ and many, many orphans and vulnerable children. It’s these vulnerable women and children that are the focus of this partnership. Tariro means 'Hope' and this is what the Support Group here is seeking to bring to the people they work with. Currently they are working with a group of around 50 people; HIV+ adults and a bunch of orphans but there are many more they want to help. They share with each other, encourage each other and from time to time little bits of money come and they buy food; but it is a very difficult situation. Regular socialising and counselling with the children is part of what they do. 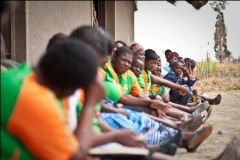 1) Feeding programme: The social set-up in Zimbabwe is such that orphans are kept in the homes of guardians who are either relatives or close friends of the late parents. If they give food to the children to take home the other family members take it off them and there is very little chance that they will get it. Many of these children (and vulnerable women) are on anti-retroviral medication (ARV’s). A number of them are HIV+. Every Tuesday they go to Harare to pick up their ARV’s but if there is no food they cannot take the drugs and so their health is being compromised. Four volunteer women from the community help with food and short term accommodation for the most at-risk chldren. 2) Fund the initial group of 20 children to go to school. 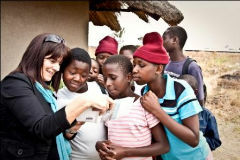 Most of the orphans have dropped out of school because there is no one to pay for their school fees. The guardians refuse to send orphans to school as it is just too costly for them. The second part of their strategy is self-sustainability. They want to move people past hand-outs so they can sustain themselves. They currently have a one hectare block of land just outside town and are negotiating the possibility of getting a large block of land further out of town. On this one hectare block of land they want to start producing vegetables and food. The idea is that all of the beneficiaries would become involved in this food production. Each would have their own plot of land and they would pay something back into a fund to help with the welfare and the issues that these people are facing. The people are very keen to work with each other to produce food and to help others. a) They want to set up a poultry layers house. The building is actually there on the property right now. c) Victor and Deliwe really struggle to support themselves. Deliwe is trained in computers and would like to set up a small internet cafe in the market centre. She would manage it, type letters for people, set up the internet etc. There is no internet cafe in town so there is real potential for a sustainable business. Many of the children do not have families. Many of the widows have no means of income. A developing aspect of this program is to empower the women to be able to support themselves and then for them to take the vulnerable children into their homes. Tariro and BHW hope that this will become a natural outcome of creating income for the women. Until the women have an increased economic capacity, it would be unfair to ask them to take on more financial burdens. Victor Chirima was an electrical engineer and shifted to Norton in 1997 to stay with his brother who was a pastor. After being there for a while the brother shifted away and the church group that he was establishing disintegrated. Victor shifted back to Harare but was then asked to go back to Norton and become the pastor. In 1999, just as Victor and Deliwe were married and starting their new role as pastors in Norton, the program of land redistribution began. The economy in Norton, which is entirely based on agriculture, began to collapse. Many farms were taken over, the white owners were evicted and many local people lost their jobs. It became very difficult for Victor to do ministry and for the church to sustain itself. As people came under pressure people became poorer and some shifted away to find work. So life in Norton and in the church became virtually impossible. As they visited around the community they discovered a lot of poverty. Victor quickly realised that to be a pastor would require a lot more than preaching sermons. The church could not support him and he started an electric motor rewinding business which went well for a while but has now collapsed. They tried to support the poor from the income from the business and were able to do that until the business faded. Deliwe then started a business cooking food for a local company. She makes and delivers the food each day using her basic household equipment and this generates a small income, between $US15 - $25/week. 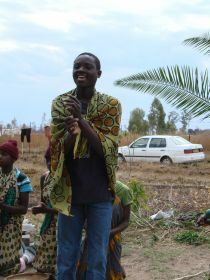 In 2008 Elecson and Victor had the opportunity to attend a conference in Kabwe, Zambia. Through interaction with other missionary workers it became clear to them that there was a lot a church can do to support their community. They were able to visit Maplehurst Farm (ZAM21) and also met with BHW's Field Director which was the start of our relationship with them. 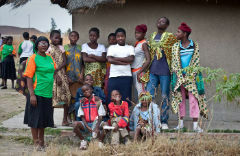 Tariro currently has a core group of 25 adults and 20 children. All of the children apart from two are double orphans. However there is the potential here to help hundreds more people. Victor, Elecson and Lloyd are three brothers with a real heart for this community and a passion to show God's love in a practical way. They are incredibly capable men and form a strong team. From their limited resources they are already helping as many people as they can and have a very clear vision of how they can best empower these people. The key leaders here are 3 brothers, Victor the pastor and his wife Deliwe, Elecson the eldest who works in Zambia and his wife Rudo, and Lloyd and his wife Locadia. Elecson is the leader of this family and the visionary. He visits Zimbabwe regularly (his wife and children still live there) and will shift back to Zimbabwe if this partnership reaches its full potential. The three brothers form a strong team with complimentary gifts and have the capacity to make a difference. 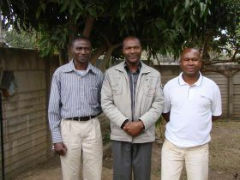 Victor and Deliwe Chirima are pastors of the Gospel Assembly in Norton. 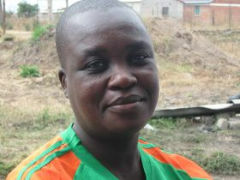 They have two children, Lavern (an 11 year old boy) and Enarah Ruvimbo (a 4 year old girl). Victor was an electrical engineer. Lloyd and his wife Locadia and children live in Harare. He works as an electrical engineer in a large company. He travels all over Zimbabwe servicing and repairing large equipment. He is able to use his company vehicle and his own personal car to help with the work. He is very generous with his resources and vehicles. 1) Rodney Tamanikwa – Pharmacist with Pfizer. Member of the Gospel of Peace Assembly in Harare Zimbabwe. 2) Albert S. Makone – Public Health Practitioner. He has worked with several organizations on the field of public health and community development. He is with the Remnant Ministries – Harare Zimbabwe. There has been interaction with other church leaders and community leaders in the area and the concept has been overwhelmingly accepted and received. c) Garden project : This requires a water pump, a tank and a generator. It also requires the purchase of seeds and fertiliser and some tools and includes ploughing the land for the first time. Kudakwashe is not going to school. There is nobody in his family to send him. His sister died in July 2010. She was 23 years old and had a baby. That baby has been taken by the husband’s family. Both his parents are dead. His sister was HIV+. His mother died in 2008 and his father in 2003. He now stays with an 18 year old sister who once worked as a domestic servant but she became pregnant and left work to look after the baby. There is no household income. They live on the goodwill of others. He has been sexually abused. The matter was taken to court but the perpetrator bribed the court officials. This boy is afraid that the guy will come back to town and victimise him again. He got to Form 1 but had to leave in 2009, he would love to start school again. He is a very clever child according to the leaders here but he requires some counselling. He wants to be taken away from his current situation so he can be safe, get food and an education. After the abuse he was tested for HIV /AIDS and has tested negative. 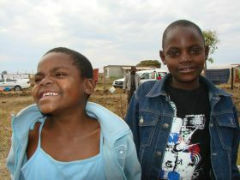 Both of these children are HIV+ and their parents have died. They live with an uncle and don’t get much food. They are both very small and obviously malnourished, especially Sekai. They only get food if they can sell brooms. The family make little brooms and they have to go out and sell them. Sometimes they get two meals a day. Their parents died when they were quite young so they don’t remember them. Both of them have been HIV positive since quite young. Tatenda is on ARV’s but Sekai has not yet started, she is probably still too young at the moment as a 10 year old. Tatenda went to Grade 6 but stopped in 2009 and Sekai has done Grade 3. 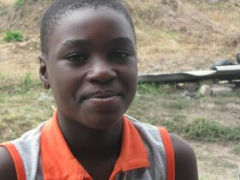 She still goes to school but because there are no exam fees paid she won’t be able to pass from one grade to the next. Both of these children are desperately in need of some assistance. You can see that they are very poorly treated and malnourished, there is a lack of life about them, pretty desperate. In 2009 Monicah had to withdraw from Grade 6 so if she went back to school she would have to repeat that grade. She lives with her step-brother and his wife. There is very limited space in the house so she sleeps in a room with a young guy who brings his girlfriends home and who frequently finds himself in bed with her. She also cops a lot of the frustration from the step-brother’s wife and often gets beaten and shouted at. Her parents both died in 2009. She is not HIV positive at the moment. She wants to go to school to become a nurse. When asked why, it was to help her younger brother who is being beaten and is very sick and couldn’t come today. He is 10 years old and is HIV negative. Monicah was in tears as we interviewed her. It is very obvious she is not in a safe situation. This is one of the girls that the women have been talking about getting out of her current situation. Comment: Monicah is in urgent need of rescue. Every day she is in this house her life is at risk. Hazvinei is a widow; she has been for 6 years. She has 4 children; the oldest is 26 and married. The other 3 are younger, the youngest being 8 years of age. 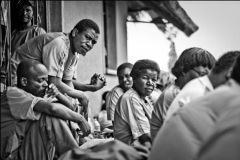 She comes to the Tariro Support Group to have friends and to be consoled in her very difficult situation. Her church has no programme or ability to help her and she is really struggling. It is a major problem for her to feed her children. She has no source of income and requires help from family members to be able to live. None of the 3 younger children are going to school. She has been tested for her status and is HIV+ and the 3 younger children are as well. There are no funds to go and get CD4 tested so they are not on ARV’s. There are many in the community who are afraid to come out and get tested. Being part of Tariro has helped her a lot in her being HIV+. It gives her some degree of dignity and support. It helps a lot to be open about being HIV+. It has helped people to help her. Many of those who are HIV+ and who come out face stigma and that’s the reason that they don’t come out. She rents a very small temporary structure to live in with her children. It is very inadequate, very cold and she is really worried about her children. Comment: This degree of poverty is a death sentence for this family. They cannot get the ARVs or the food to make life sustainable in the long run.